Crosswalks on Penn & Pacific Aves. 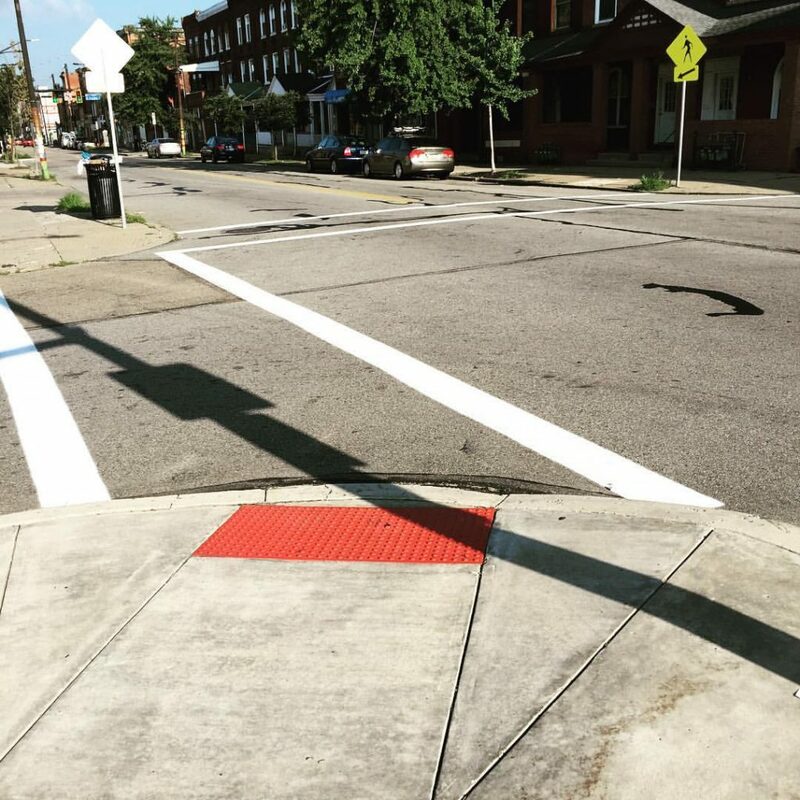 Thanks to Garfield’s concerned residents for making these crosswalks at Penn and Pacific Avenues a reality in our neighborhood! Three cheers for the city stepping up and responding to all the local 311 calls for crosswalks. Photo by Minette Vaccariello. 1) Immediate openings – Positions at the Bloomfield-Garfield Corporation’s afterschool program at Pittsburgh Arsenal and Pittsburgh Woolslair. Up to $15 an hour depending on experience. 2) Immediate opening– Manage the Neighborhood Learning Alliance’s “Everyone Graduates” high school program. Hourly rate of $16 to $20 an hour. 3) Anticipated March opening – Eastside Neighborhood Employment Center is seeking multiple individuals to assist with recruiting 14 to 21 year olds for the “Pittsburgh Summer Learn and Earn” employment program. Positions could lead to full time work throughout the summer. 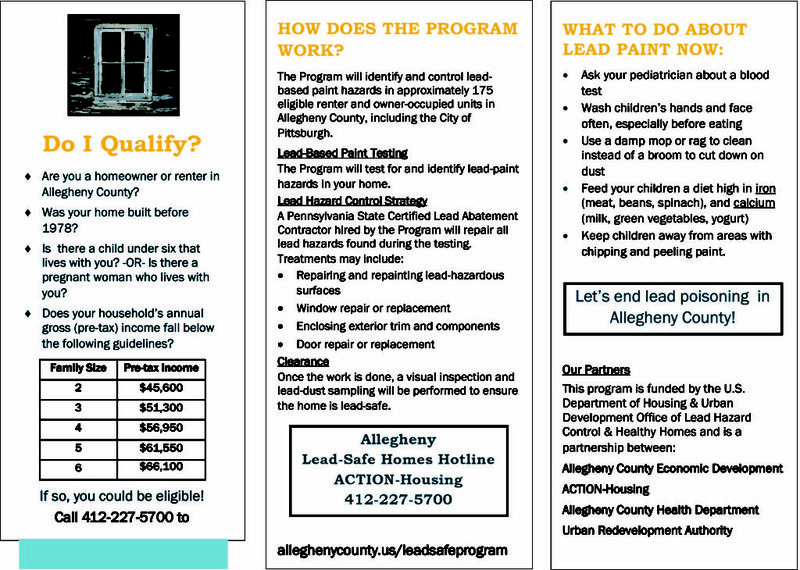 Openings in the West End and East End of Pittsburgh are anticipated. 4) Summer openings – The Bloomfield-Garfield Corporation is seeking to identify as many as 5 workers that would operate its Learn and Earn Summer youth employment program. 5) Immediate opening – Garfield Jubilee Association is seeking a “Youthbuild Education Project Leader.” See the attached job description. 6) May opening – Earthen Vessels Outreach is seeking a Summer Food Program Manager. Looking to hire someone who could be a long-term hire, but for summers only. TO LEARN MORE ABOUT EACH OF THESE OPPORTUNITIES, FOLLOW THIS LINK: NOW HIRING!!! Are you looking for a job that involves shaping young minds? Look no further because the BGC and Neighborhood Learning Alliance have just the job for you. A local afterschool program is now hiring another support staffer to attend to the academic and social needs of students from Pittsburgh Arsenal K-5 and Pittsburgh Woolslair K-5. Work afternoon hours and earn good pay while helping elementary school students boost their reading and mathematical skills. Some leadership experience is required; all candidates must pass various background checks. Click the link below to learn more about this excellent career opportunity. Beginning on Dec. 1, two well-known and well-respected nonprofit organizations, the Girls Scouts Western Pennsylvania and Goodwill of Southwestern Pennsylvania, are teaming up this year for the holidays. 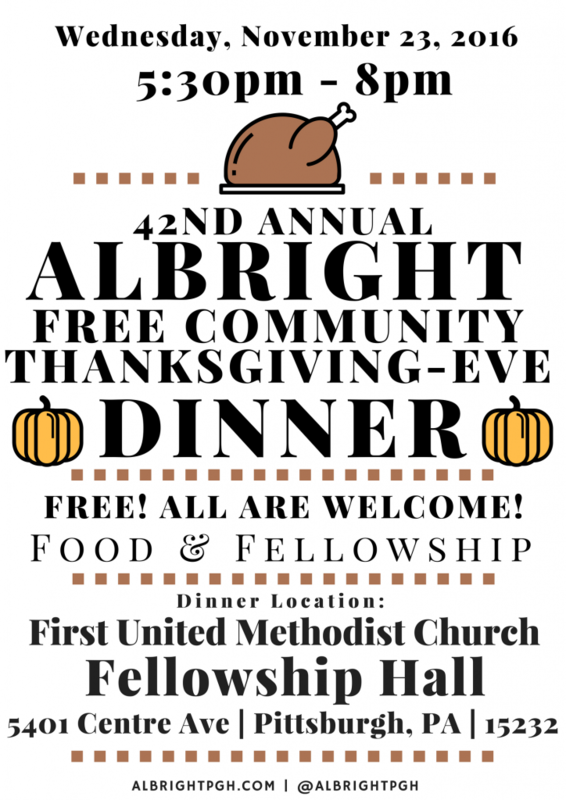 Together, they will conduct the “Give A Little Love” Holiday Clothing Drive and Community Service Project during the month of December. Girl Scouts will be collecting gently used items for donation to Goodwill for the winter months when donations are needed most. Items donated will be sold in Goodwill stores to support the agency’s mission to provide job training and education to help people with barriers to gain employment. During the “Give A Little Love” Holiday Clothing Drive and Community Service Project, Girl Scouts will distribute donation bags to family, friends and other partners throughout the community. Later, they will collect the donation bags and deliver them to their local Goodwill store and donation center by December 31st. Goodwill SWPA and the Girls Scouts Western Pennsylvania are calling on the public to support the project by cleaning out their closets to help to Girl Scouts fill the donation bags. Participating Girl Scouts will have the opportunity to earn a patch provided by Goodwill recognizing their fulfillment of community service. Additionally, the top three Girl Scouts who collect the most donations will win a paid trip to camp; courtesy of Goodwill SWPA. For more information on the Give A Little Love Holiday Clothing Drive and Community Service Project, or to receive general information about how to partner with Goodwill on a community donation drive, visit www.goodwillswpa.org/host-donation-drive or contact Danielle Hardy at 412-632-1875 or danielle.hardy@goodwillswpa.org. 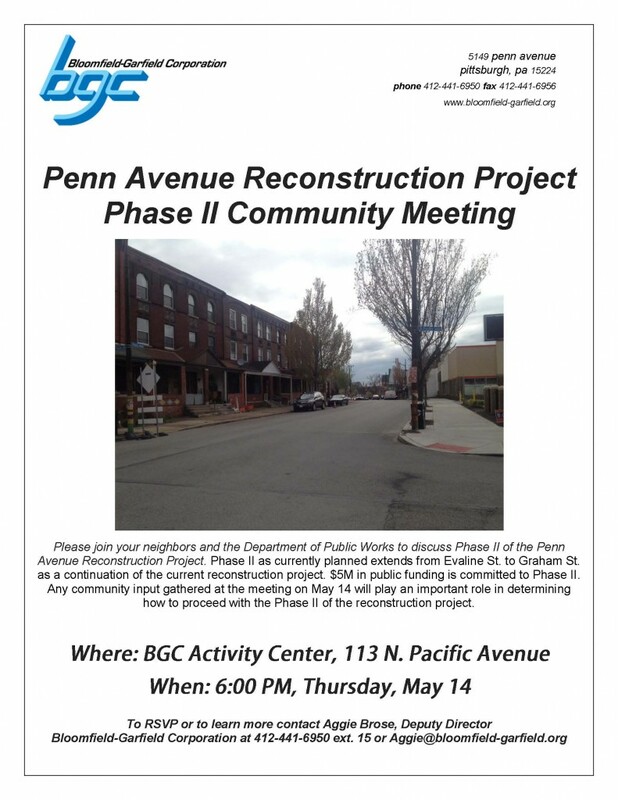 The Bloomfield-Garfield Corporation invites you and your neighbors to discuss the scope of Phase II of the Penn Avenue Reconstruction Project (Evaline to Graham Sts.) with the Department of Public Works. 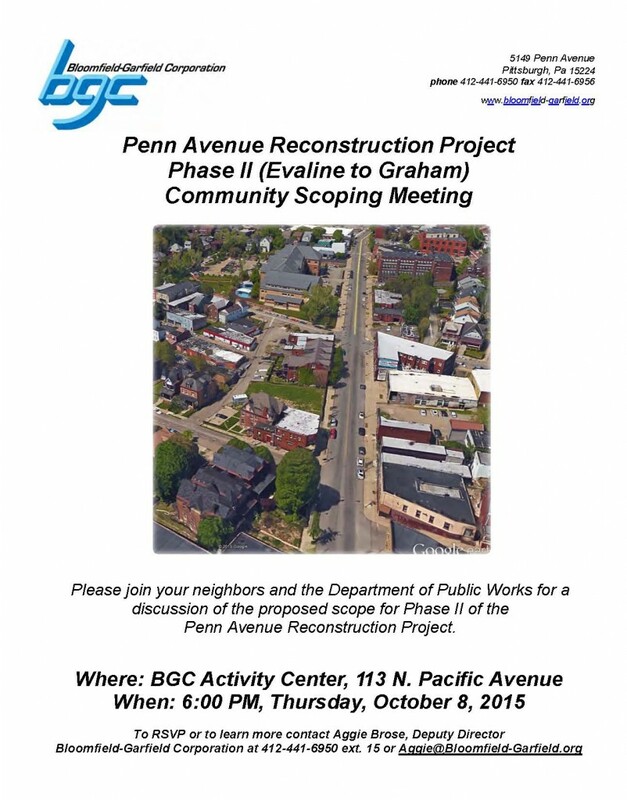 Head over to the BGC Activity Center (113 N. Pacific Ave.) this Thursday at 6 p.m. to take part in the discussion. 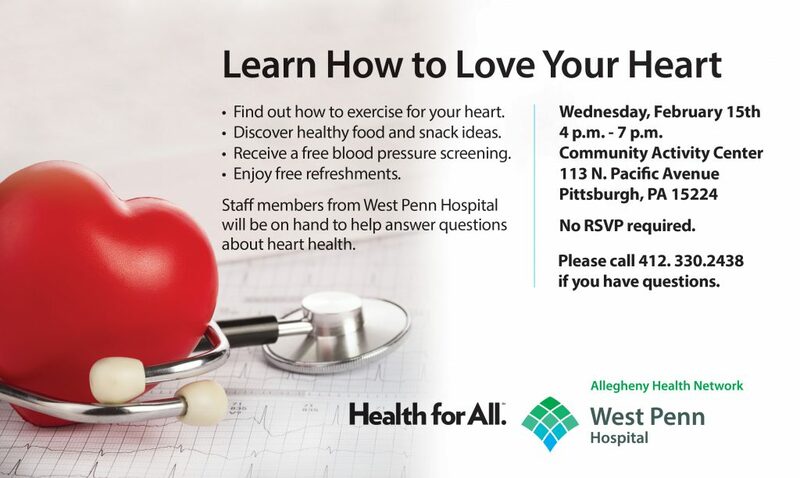 To learn more or RSVP, contact Deputy Director of the Bloomfield-Garfield Corporation, Aggie Brose, at 412-441-6950 (ext. 15) or Aggie@Bloomfield-Garfield.org. Tonight, at 6pm, the BGC hosts a community meeting for local residents to voice their opinions about the Penn Avenue reconstruction project and learn more about its second phase of planning. The meeting, which is open to the public at the BGC Activities Center (113 N. Pacific Ave.), will give neighbors and business owners a chance to speak with city officials and construction experts. This dialogue is crucial to ongoing planning efforts for Phase II, so everyone is encouraged to input their suggestions at tonight’s meeting.